Through a series of Twitter coincidences, I ended up having a back-and-forth just now with Gardner Campbell about the readings for Connected Courses. I had to confess that I didn't do a lot of reading for Connected Courses; I tried to keep up with reading the blogs in the blog stream and following the Twitter stream, which is also how I am approaching the Rhizo15 experience, focusing what time I have on reading the blog posts that people share. In fact, my first big Rhizo15 self-assigned task was creating an OPML file of all the blogs I could find both to read AND to share: Rhizo15 Combination Feed in Inoreader. So many blogs!!! And please add your blog if you are not there already! So, at least for me the content emerges in the conversation itself rather than being defined in advance, even tentatively defined in advance by assigned reading lists. That is something that really makes sense to me in an un-course experience, which is how I saw Connected Courses (although I now see from Gardner Campbell that he hoped it would be more course-like) and which is how I see Rhizo15 (which seems very content - conTENT - with being an un-course). Now, in my own courses, it's . . . complicated. Unlike Rhizo15 or Connected Courses, my students have not shown up out of sheer curiosity. They have shown up because they are required to take General Education courses, and that is what I can offer: University of Oklahoma upper-division General Education, Western Humanities and Non-Western Humanities, taught fully online. My classes always fill up pretty much instantly because there are a lot of seniors who need Gen. Ed. to graduate, and online is the option that fits everyone's busy schedule. So, yes, for those courses, I do have to define some content. But my goal is to offer LOTS of choices to the students as the content goes (trillions of choices, ha ha, as I explain here in the introduction to the Myth-Folklore UnTextbook). More importantly, the REAL content of the course is what the students themselves create, as I explain here: The Shift from Teaching Content to ... Teaching Writers. A big part of what finally prompted me to create the Myth-Folklore UnTextbook last summer was all the great projects my students had done in the past. Working with them on their projects over the years had made me aware of the kinds of stories that really appealed, along with the great public domain resources available to make those readings part of the class. So, I created the Myth-Folklore UnTextbook last summer, and the transformation in my classes this year as a result was AMAZING: students used to have a choice of 2 readings each week in that class, but now with a choice of 16 readings each week, week after week, the energy level was just buzzing, and now by using the feedback I have gotten from the students (they rate each unit), I will be able to add more/better units in the future. And this summer, I am going to try to transform my Indian Epics class in much the same way (I made that my own Rhizo15 subjective in fact; details here: Summer is Coming). Epics are less modular than mythology and folklore, so it is a challenge... but in a big epiphany in December, I realized that it would be possible to make an UnTextbook in Indian Epics, and I've gotten feedback from students this semester that will help me do a good job with that this summer. Here's the thing about content, though: even if I do an awesome job, including all kinds of wonderful things for the students to choose to read, I will also be excluding things... but then it will be students to the rescue! Because WITH THEIR PROJECTS the students will be bringing in all kinds of stories and topics that I did not find room for... not because I wanted to exclude any of those stories or any of those topics, but just because I ran out of time/space, or because of my own ignorance. So, even with the UnTextbook, it will always be the students who are keeping the class alive and wild, going beyond any reading list I could ever create in advance, bringing in the topics and stories they care about the most. And by seeing what they bring to the class, I get better and better ideas of what to put into the UnTextbook. And around and around we go, in a circle of reading virtue! Read on! Write on! RIGHT ON!!!!!! 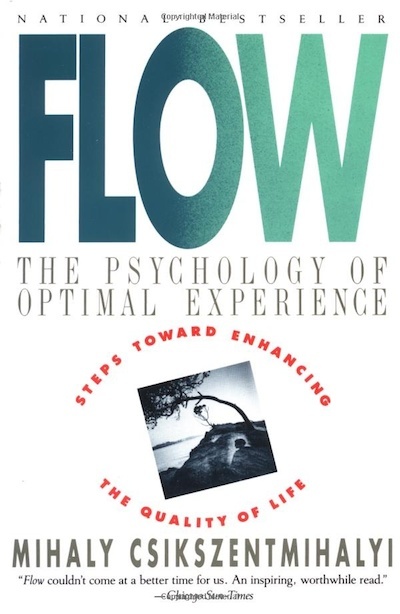 Thanks to a #Rhizo15 post which reminded me just how much I like the book Flow by Mihaly Csikszentmihalyi — Getting into the Flow: a post for #Rhizo15 — I got the idea that we could maybe have a rhizomatic book club and, in particular, I would really like to get something like that happening at my school (University of Oklahoma), building on the good energy we got going with our Twitter chat experiments for #OpenTeachingOU this semester. Our Twitter chats benefited so much from what I learned by watching and occasionally participating in various edu Twitter chats over the past couple of years, and I would LOVE to get ideas and advice from people who participate in virtual book clubs about what has worked best for them! Those Twitter chats grew out of a phone conversation that Rob Reynolds (NextThought guru, and formerly of OU), Stacy Zemke (OU OER goddess) and I had back in February... we had fun talking on the phone together, but we realized it would obviously be even more fun — and useful! — to get more people in on the conversation, and sure enough, some people from OU participated, and some other people joined in too, which was just great: by making the conversation open and online, we managed to get some people together who come from different parts of OU, and also some people who are not at OU but who were interested in the topics at hand. So, when I was thinking about how fun it would be to read Flow together with Rob and Stacy and any/all the folks I know online who would be interested in doing that together, I got the idea of proposing an "online book club" that might even be sponsored by our Center for Teaching Excellence. They offer all kinds of great face-to-face workshops, but so far they have not done anything with online workshops that are asynchronous, taking advantage of different kinds of online spaces to connect and share. If CTE would sponsor the book club so that the OU participants could maybe get the cost of the book covered (Flow for Kindle, for example, is $9.95), that would be really cool... but of course even without such sponsorship, we could make it work! So, I'm going to just brainstorm here some of the cool things I would like to see happen as a result of this. 1. Read/re-read some COOL BOOKS about learning, education, communication, etc.! I know I would get so much more out of reading books together with others. 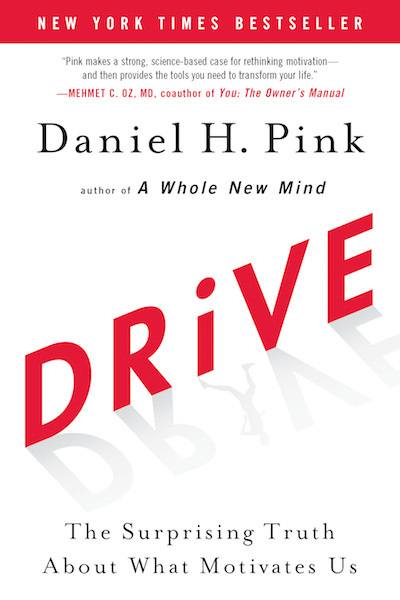 Some of the books I have read in recent years that had a big impact on me and which are of general education interest would be Csikszentmihalyi's Flow, Daniel Pink's Drive, Gleick's The Information (AMAZING book, IMO; I loved that one), etc. And then of course there are all the books I have on my book list that I have NOT read and which a book club would prod me to read, plus I would benefit from other people's suggestions about what to read. 2. Have a chance to talk ABOUT READING with people. This is something I am increasingly obsessed with as I work on my classes: I am very happy with how the writing components of my classes work, but the reading components need so much improvement. What do we do when we read? How do we read? Why do we read? It would be so great to make this both a book club and a meta-book-club about reading itself. 3. Support DISTRIBUTED CONVERSATIONS that happen via blogs and other online spaces. I have been so happy with the results from curating a #Rhizo15 blog feed (more about that) — it took so little time and has resulted in a fantastic source of stuff for me to read and explore every single day! 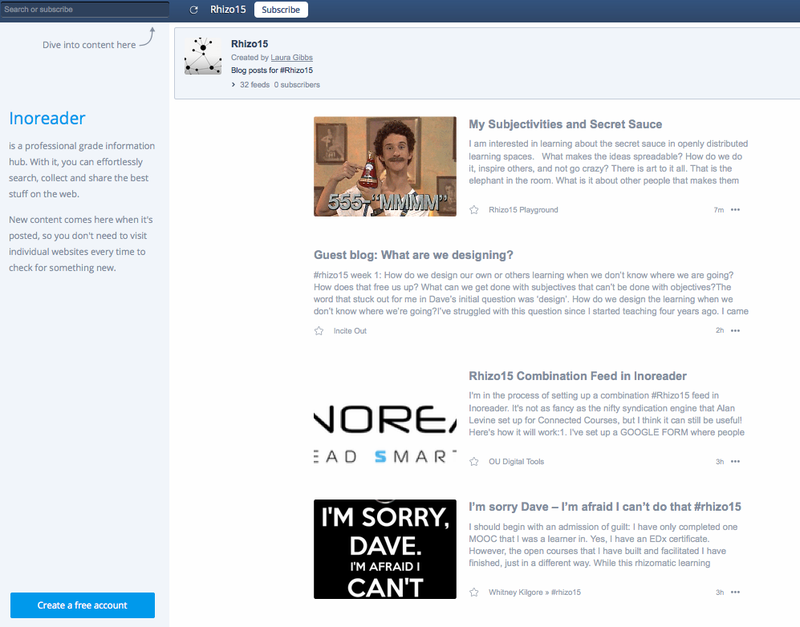 So, I know feel really confident about using Inoreader as a way to consolidate and re-share blogs and also Twitter and Google+ content so that conversations can take place across spaces. Given the size of #Rhizo15 (there 62 feeds now), I haven't been collecting the comment feeds for the blogs also, but it is do-able of course (I follow comment feeds for my students' blogs), so I know we could build a really cool distributed network of blogs, comments and additional online presence, just with simple use of Inoreader, nothing fancy required. 4. Support faculty in building ONLINE PRESENCE. For those distributed conversations to take place, faculty need some online presence: a blog, Twitter, Google+, something that lends itself to crossplatform connections (Facebook does not do that very well). 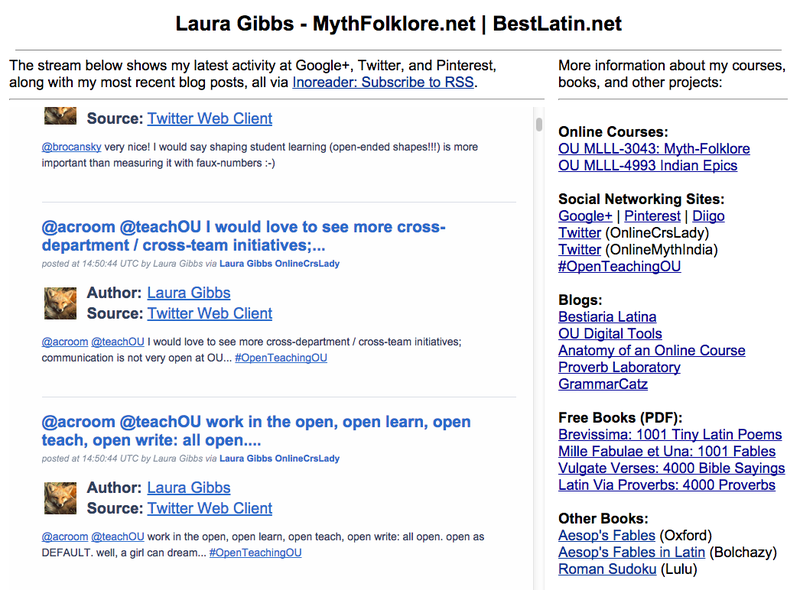 I've found it very easy to get my students up and running with blogs on the first day of my online courses, and so I am confident we could get faculty up and running too, especially with the opportunities provided by create.ou.edu which allows them to own their own domain online if they want to do that. 5. Integrate book chats into our TWITTER CHAT schedule. I am hoping that we could carry on with our OpenTeachingOU Twitter chats, and once every two week seems a good schedule for that, in which case it would be easy to fold in some book chats into the mix over the course of the semester. I am thinking the book chats would not be 100% focused on the book itself, but instead would be a chat topic INSPIRED by the book, which would go in whatever directions it goes in, but which would be of interest to anyone reading the book for the book club. The idea is that people would participate in the Virtual Book Club whatever way they want with the book club: blogs, Twitter, Google+, other online sharing... and for people who want something synchronous, there would be these Twitter chats, along with support for people getting started who might never have done a Twitter chat before. So, I am curious what people think... people who do book clubs online... people who have been participating in our Twitter chats... OU people whoever you might be! What are good strategies for virtual book clubs? 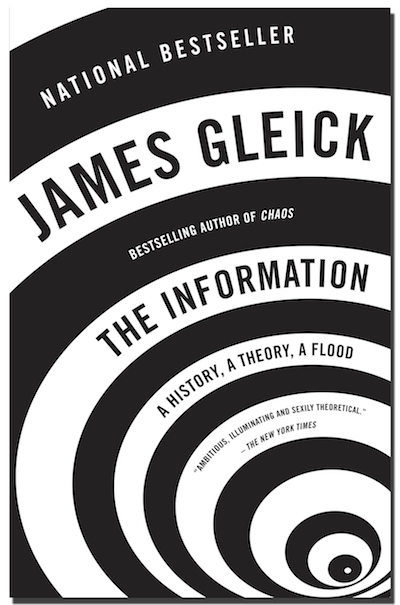 What really exciting/useful books would you recommend? Update: Thanks to a rhizo15 connection, I have found this VERY idea-filled post from Laura Gogia: A Gathering Together: My #TJC15 Connected Learning Experience. The flow experience is when a person is completely involved in what he or she is doing, when the concentration is very high, when the person knows moment by moment what the next steps should be, like if you are playing tennis, you know where you want the ball to go, if you are playing a musical instrument you know what notes you want to play, every millisecond, almost. And you get feedback to what you’re doing. That is, if you’re playing music, you can hear whether what you are trying to do is coming out right or in tennis you see where the ball goes and so on. So there’s concentration, clear goals, feedback, there is the feeling that what you can do is more or less in balance with what needs to be done, that is, challenges and skills are pretty much in balance. That sense of flow is something really important for me in my work, and also an experience I hope my students will achieve also. 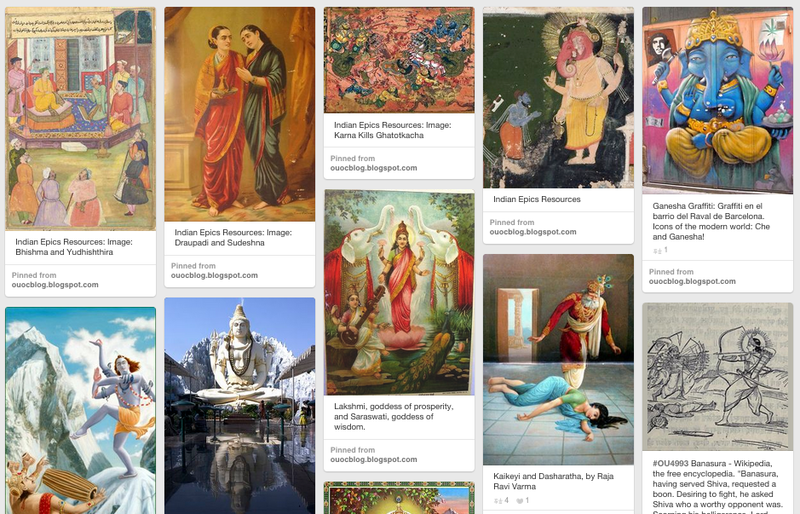 So, in this post, I want to think about how I can create an Indian Epics UnTextbook that can really help student experience that sense of flow. 1. Arousal v. boredom. One of my big goals in switching from the four paperbacks I've used in this class to an UnTextbook approach is to reduce the threat of boredom! Some thoughts about that here: Indian Epics UnTextbook: BIG Reorganization of the Class. Including comic books into the mix (which had not happened when I wrote that post), will be great for combating boredom. I am sooooo excited about having these comic books as part of the class reading now! 2. Challenge v. relaxation. The comic books should be really fun, and I think the students will feel especially confident about reading the comics (as opposed to the worry and even anxiety that can result when they are reading something that is really alien/alienating, which can easily happen with the epics, especially at the start of the semester). At the same time, I want to make the comic books a good learning challenge also, asking students to think about how the comic books relate to the traditional legends which are the "raw material" that the comic book authors and artists are using. To do that, I'm making Reading Guides for the comic books that ask students to learn more about the background material and read traditional legends side by side with the comic books. I've started writing up Reading Guides for the comic books here: Amar Chitra Katha. 3. Clear goals and progress. One of the most important things I learned from the Myth-Folklore Untextbook this year was the power of the half-reading option; if a student does not get started with the reading at the beginning of the week, I want them to focus on doing the other half of the reading, always moving forward and not worrying about what they did (or did not do) in the past. I am really glad the more flexible reading options of the UnTextbook have helped give the students a sense of always moving forward. No matter how badly the week might start, there should always be a way to finish the week strong! Having highly modular reading in Myth-Folklore was such a boost for that class this year, and I am looking forward to getting the same boost in Indian Epics next year. So, instead of having paperback books to read that last either two weeks or four weeks, the Indian Epics class will not have a whole range of reading options: materials that are for a half-week (a single comic book), or one week, or two weeks, or three weeks, or four weeks (some students do thrive on the continuity that a whole book provides, and that option will still be available too of course!). 4. Clear and immediate feedback. The Reading Diaries were something new last year, and I am really happy about how they turned out. One of the things I will be doing this year is adding in a peer feedback activity for the Reading Diaries so that students will interact with each other more via their Reading Diary posts. Now that I have Inoreader to help me create specific blog post streams containing students' Reading Diary posts, I will be able to make that work really well! Students will also be able to learn a lot from watching each other's reading choices. I saw that happening in Myth-Folklore this year, and I am excited that I will get to see the same thing happening in Indian Epics. 5. Confidence. As mentioned above, I had a big organizational breakthrough that I think will really boost my students' confidence in the Indian Epics class. Since the epics are new to most of the students, the reading can be intimidating, and even when I offer choices about the reading, they are not able to be confident about their own preferences. In the new UnTextbook, we will cover both epics in the first half of the semester, and that will give students more confidence as they make their own reading choices in the second half of the semester. I also hope the "anthology" approach that I am taking in my own "Public Domain Editions" of the epics will help students feel confident in those reading choices since they will have some familiarity with different sources they can choose from. Yesterday I wrote something about MSW and the time management challenges I face as a teacher: each week, I try to interact one-on-one with each of my students (90 total, across 3 classes) in a meaningful way, providing feedback about their semester-long writing project. Teaching online has given me the freedom to arrange that daily work schedule so that I am extremely productive in the time available, following my own daily rhythms and sorting out my tasks to suit those rhythms. I am also really lucky in that I enjoy all of the tasks that are on my to-do list: reading the students' stories and browsing their blogs, helping them learn about different technology tools, and also sharing campus news and online learning resources with them every day. So, everything clicks, and the flow is good: I'm a little tired at the end of each day, but eager to start work the next day, and I'm pretty seriously tired by the end of the week on Friday, but it's easy to recharge by Monday. Plus, at the end of the semester, the work tapers off naturally, so that I have less and less to do as more and more students finish the class, which suits my end-of-semester energy level. With my students, though, time management and "flow" are more of a problem. I work really hard with the students on time management options, and my course is designed in a super-flexible way so that they can create their own schedules, and they also have lots of "wiggle room" for unexpected problems that come up (details). You could say that I try to design with flow in mind. 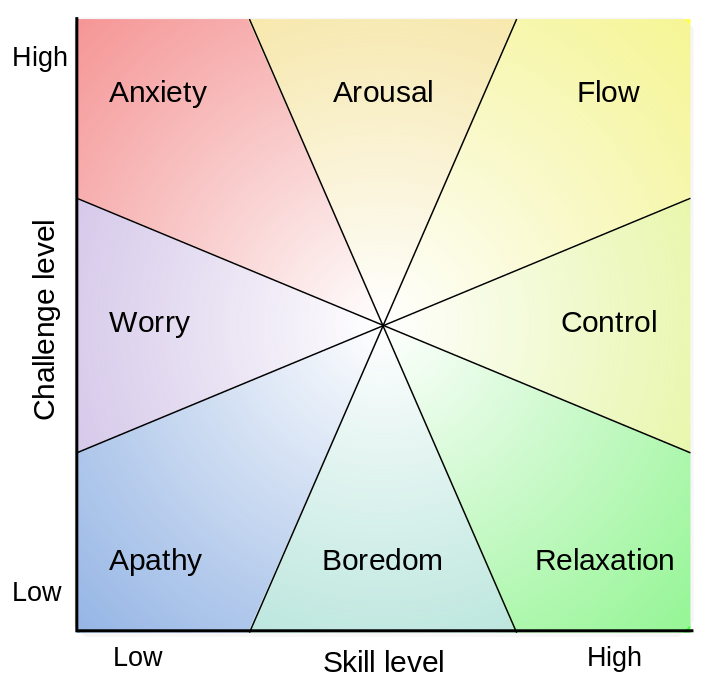 To get a sense of what flow means in the context of course design, here's a very nice post from John Spencer's blog: Five Ways to create a State of Flow in the Classroom. And yes, I am pleased to say that a lot of students really appreciate the freedom and flow that an online course offers. They create their own schedules and they work ahead, and some of the students finish the course several weeks early. I encourage them to work ahead and finish early because I know they have other courses which pile on all the work at the end of the semester (especially the "Capstone" classes which students at my school usually take in their senior year). If they have high-stakes exams or projects in their other classes, being able to get this Gen. Ed. class completely out of the way a few weeks early can be a big help. Yet I also have students who are really lost without the structure provided by a rigid class schedule in which the teacher makes most or even all the choices about what to do when. For 15 or more years of their lives (I teach mostly seniors), they have gotten used to the idea that someone is always telling them where to go and what to do. It's a Pavlovian thing, which means when I ask students to make their own choices and create their own schedule, I am going against years of behavioral training. Don't believe me? Just ponder this post by Bernard Bull: What behavior is reinforced 16,000 times by high school graduation? So, here's how that sorts itself out: we are now at the last week of the semester, and almost exactly half of my students are done with the class (43 of them), while the other half are still doing the work for the class (47 of them). Of those who are still doing work for the class, some of them will still be doing work until literally the last minute: this Friday, May 1, at noon. Why? Because they arrange their schedule based on the absolute last possible deadline. Unfortunately, that is a stressful strategy, and it's risky too: the longer the wait, the more likely it is that some unexpected snafu of time or technology might actually prevent them from completing the work they need to do (students do their own grading in my class based on completion of their work; more about that: Grading). In short, it's a culture clash: I get to spend my entire work week in an environment that I control, but my students do not. The students who are enrolled in my class are also enrolled in other classes which might have a very different culture, not to mention whatever culture might prevail in their workplace (and most of my students work at least part-time, with quite a few of them working full-time... that, in fact, is often why they end up in an online class to begin with). So, if most or all of their other classes are based on a rigid, teacher-driven, standardized approach, it just adds to the cognitive burden when they also have this one, weird, open-ended class. It makes sense that some students (in fact, quite a few students) are going to be reluctant to re-invent themselves just for one class, preferring instead to follow the same routine that works so well in their other classes: wait for the teacher to tell you what to do and when to do it. Which is not to say that I have any regrets about the way I design my classes, but I'm also very aware that — to badly mix some metaphors here — I am a rhizome swimming against the tide of school culture. A merry heart goes all the day. I'm finally get around to Dave's challenge for this week: What should we count? I definitely don't want to try to measure learning with a number... but there is something that we measure all the time, so to speak: time itself. And that's what I want to write about in this post. There is lots of say (and not enough time to say it in, ha ha), and I'm not sure where to start, so I'll just start with a post I read last night which I've been thinking about, it's Lisa's Rhizo15: Symbolic measurement. Lisa is one of my online teaching heroes, and every time we trade ideas about teaching (I have gotten so many ideas from her over the many years I've followed her blog! ), I am struck by the impossible difference in our two jobs: we both teach online, but Lisa has over 200 students, while I have less than half that, around 80-90 students. Now, it is not the number of students that is the problem in and of itself: Lisa and I both have the cognitive capacity and emotional capacity to work with all those students (we both love to teach)... the problem is TIME. I have just enough time, barely, to work with all my students on their learning process each week, but Lisa does not have that luxury of time, so she ends up having to focus on learning outcomes, as she explains in the blog post, knowing that this is just an administrative necessity. Luckily, the administrative requirements of assessment do not stop the students from learning all kinds of important things, as Lisa writes about so hopefully. I want to take up this idea of time and students, though, and I want to think about how I measure them together as I design my courses: I have 80-90 students in my classes each semester. That number of students, plus the 40 hours per week I have as a full-time online instructor, are determining factors for my course design. More specifically: that number of students, plus the number of hours per week, are what allow me to provide detailed feedback every week to every student about their written work. And I mean DETAILED feedback, sentence-level feedback of a kind that most students have never received about their writing before. It is a powerful type of feedback, very motivating and also very effective: the time I spend giving that feedback is then amplified by the even greater amount of time it takes for the students to revise their writing, as they actually learn something about the craft of writing. As a result, I am able to engage with the students in a way that is really satisfying for both the students and for me, totally different from what always seemed like very superficial, random engagement when I taught in a traditional way in a traditional classroom. I have taught this way since I switched to teaching online back in 2002; a lot has changed about my classes over the years, but this fundamental model of working with the students on their writing and revision every week has remained exactly the same. It works perfectly for me ... but only because of the numbers. So, let's do the numbers: 40 hours per week as a full-time online instructor, of which I spend 30 hours giving feedback to students about their writing (I spend the other 10 hours doing what I would call professional development: interacting with colleagues online, doing course development work, all those activities that ultimately benefit my students but which are not directly "teaching" them). In any case, the core of each day, Monday through Friday, is giving feedback to students about their writing. So, let's call it 90 students in my classes (that happens to be exactly how many students I have this semester), 30 hours per week, which is 20 minutes per student per week. Minutes per student per week: MSW. My classes are 20 MSW. That's an average, but it's a pretty good average; in fact, it matches up with another way that I think about how I measure my work, using two different averages: I figure about 30 minutes on average for feedback on an original piece of writing, and about 10 minutes on average for feedback on a revised version. (The length of the assignments is pretty much the same, 800-1200 words or so; you can find out more about the students' writing projects here: Project Nominations: a special post for #Rhizo15). Again, these are all just averages, but they are pretty good averages, and they rule my life every semester all semester long: if the numbers didn't work, I wouldn't be able to get through the stack of student writing each week ... but with very rare exceptions, I do indeed manage to "clear out the stack" on Friday afternoon, very happy every week about all the fabulous work the students have done. I usually save what I expect will be a really fabulous story to do last of all on Friday, so last night, for example, I read this delightful take on Perseus and Andromeda as my last story of the week: Saving Andromeda. So, yes, the numbers are important, but don't get me wrong: while the numbers may give a sense of sameness about what I do, there is nothing boring or routine about my job at all! I may be spending the same amount of time each week reading the students' stories, but the stories are always so different, so creative, so unpredictable, that nothing ever feels the same. Every week is so different, full of wonderful new stories. But let's get back to the numbers. Dave had asked what number would be useful to report to administrators. There are lots of numbers I could report about my classes: number of blogs and posts and comments, number of words written, number of words read, etc. But the number that I see as really essential is the MSW: minutes per student per week. It is the 20 MSW that allows me to give substantial, encouraging feedback to students on their writing every single week. But the university does not measure what teachers do this way. Instead, the university measures course load. According to the contract (a yearly contract; I'm an adjunct), I am supposed to teach three online courses per semester. Tenure-track faculty at my school teach two courses per semester (they can choose to teach online; few do). That is our so-called "teaching load," i.e. course load. Yet this course load measurement is absurd: it assumes that what you are doing is teaching the course (i.e. delivering content)... not teaching students. It assumes that the workload is the same for a course regardless of the number of students... which, sad to say, is true for lecture courses. Of course, the MSW makes most sense for a course where there is lots of one-on-one student contact, which is how my courses work. How would you measure MSW in a course where most of the contact is not one-on-one but one-to-many, where the teacher is teaching a classroom full of students...? MSW is very low in a traditional class, except for the few minutes of time each week when a student is actively in dialogue with the instructor. Just do the math: 150 minutes of teacher time per week, 30 students in the class, resulting in an MSW of 5. Of course, the instructor is supposed to spend time outside of class responding to student work, just as I do. That's the key: tenure-track faculty at my school are supposed to spend 40% of their time on teaching, which is 16 hours per week. They only have two courses a week... and that could mean anything in terms of number of students of course, but let's assume they have the same number of students "per course" that I do, 30. So: 16 hours per week (6 hours in class, 10 hours outside of class) for 60 students total... for an MSW of 16. Now, that's pretty interesting: their 16 MSW turns out to be very close to the 20 MSW in my classes. My way of teaching online represents a very different way of interacting with students than in a traditional classroom-based class with required seat time each week, but the MSW is more or less the same. Another big difference is that most faculty don't spend 16 hours per week on their courses every week; instead, they have huge bursts of grading activity at midterm, finals, etc. But that's a course design choice of their own making; if they wanted to, they could follow a very steady workflow model. Without that steady workflow model, it's actually pretty hard to know whether they are putting in 16 hours per week overall, but that's a separate problem. For the purposes of this post, I'll assume that, overall, they are putting in 16 hours as the university expects them to do. So, when the tenure-track faculty are teaching two courses with the same number of students per course as my three courses, we end up with comparable MSW measures. But remember: these MSW calculations are driven not by course load; the course load does not even enter into the calculation! What enters into the calculation is NUMBER OF STUDENTS. So, for example, if I had 200 students as Lisa does, my MSW would plummet to 9 minutes per student per week, less than half what I have available now. Even if I gave up my precious 10 hours per week of development time and worked like a machine, reading student papers 40 hours per week and doing nothing but that, the MSW would still just be 12, which I don't think would be enough to sustain the writing-intensive courses I currently teach. I would have to completely redesign my courses based on the lower MSW. And what about the faculty at my school? How many have the luxury of teaching two courses of just 30 students per course...? There's no easy way to find that out, because the university regulates only the course load, not the student load. We have the student enrollment data, so it would be very easy to calculate the student load — we just don't want to do that. And one reason, surely, is because course sizes vary; they vary A LOT. In particular, my school, like so many public universities, relies heavily on huge lecture courses to make the budget work. That's where the dollars and cents come in. So, let's take a moment to add another factor into the equation: measuring not time, but money. I make $42K per year, and even if you figure my benefits very generously (I don't know what the exact dollar figure is for my benefits), my instructional cost per student is appx. $300 per student (that's for 180 students total in a year). A tenure-track faculty member makes much more than I do, and they have a lower course load. So, if they teach courses the same size as mine, their instructional cost per student is higher both because they make more money and because they teach fewer students than I do: for a tenure-track faculty member, the instructional costs would be a whopping $700 per student, assuming that the faculty members are each teaching about 4 courses per year with 30 students per course for a student load of 120 per year (and I'm really guesstimating for average salary plus benefits, but you get the idea). But is that really the student load...? There is no way to tell because we don't report faculty student load, only course load. And here's the thing: if you want to reduce the instructional costs per student, the single best way to do that is to increase the student load by offering big lecture courses. If you have a faculty member who teaches a big lecture course (the "large course" category at my school includes courses with 600 or more students), then the instructional costs shrink dramatically: if you teach 1200 students per year, for example, instead of 120, then the instructional costs drop from $700 per student... to $70 per student. Do we charge the student less tuition for those huge lecture courses? Of course not. KA-CHING. But I'm not going to go there now; how money rules the university (and it does) is a separate subject. What I want to talk about here instead is student learning, and how MSW is a factor in that learning. You might rightly object that the MSW is not really the right number to measure, since what students learn is actually about the time that the students themselves spend and how they spend it, independent of teacher time, which is what the MSW measures. And I agree: students cannot learn without spending time, their own time, and the MSW is meaningless unless it is also part of the time that the student is spending. But here's the thing: I see my MWS as a multiplier, a way to maximize student time. My goal is to give students encouraging, useful feedback that will lead to them spending more time on their work for the class because they want to spend that time, using the feedback they get from me (and from the other students) to improve their learning experience. Insofar as a student has time to spend on my course, I want to maximize that time by giving them really stimulating things to do with lots of feedback to propel them to go farther, to do more, to keep on learning, following their own learning path. The more time that I can devote to each student each week to help them in that endeavor, the better. So, yes, I know that MSW is "just" a number, and it's not even a number that my university counts, but I know it is a crucial factor in my work as a teacher. Not all the minutes per student per week that I spend are of the same quality, but having those minutes to spend is essential: without them, how could I be a teacher? And, more importantly, how could I aspire to be a good teacher? I need time to teach (and learn about teaching), just as my students need time to learn (and learn about learning). So, that is my number-crunching for Rhizo15 this week. And thank you for taking the time (!!!) to read about what I learned from the crunching. And now, it is Saturday, so I am going to go do ... nothing. Whoo-hoo! Aliud agendi tempus, aliud quiescendi. There's a time for working and a time for resting. I'm in the process of setting up a combination #Rhizo15 feed in Inoreader. It's not as fancy as the nifty syndication engine that Alan Levine set up for Connected Courses, but I think it can still be useful! Inoreader is an RSS reader but, unlike most RSS readers, it is a powerful syndication tool also, so that you can create your own "combination" feeds and share them with others. 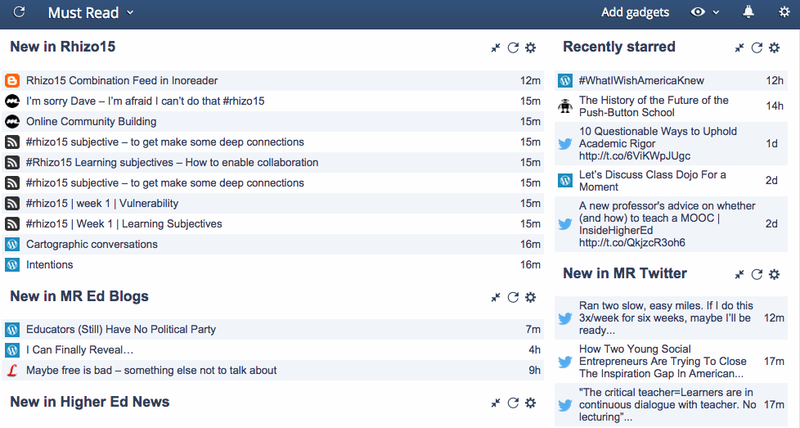 So, I'm making a combination feed of all the #Rhizo15 blogs I can find. You can use the resulting RSS feed (plus OPML file) in any feed reader that you want. 1. Share your blog! I've set up a GOOGLE FORM where people can share their RSS feed, either the feed for their whole blog or just for Rhizo15 posts. 2. I'll add to Inoreader. Each day I'll grab those RSS feed addresses and add them to my Inoreader. I'll put them in a folder called "Rhizo15." 3. Grab for your own use. That public Inoreader folder generates its own RSS feed for the Rhizo15 folder along with an HTML clippings stream, plus a public OPML for that folder. Meanwhile, I harvested some blog addresses from Lenandler Singh's spreadsheet to get the feed up and running. If anybody else is running something like this (a spreadsheet, OPML, anything like that), let me know in the comments here or at Twitter (@OnlineCrsLady). TWO WEEKS UNTIL SUMMER. 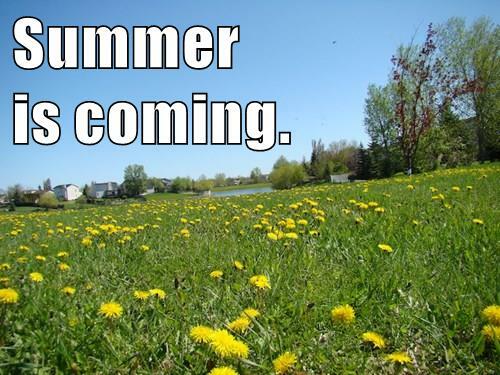 It's like the anti-Stark motto: Summer is coming . . . I cannot believe it myself, but it is true! School started so early this semester that I finish up on the afternoon of Friday, May 1... and Fall semester does not start until August 24, which means August 17 for me (I always open my classes one week early). So, that is all of May... all of June... all of July, then two weeks in August to do all the actual getting-classes-ready. THREE WHOLE MONTHS. The next time I moan about how little I get paid, I need to remember this most incredible of all possible luxuries, afforded by very few jobs on this planet: TIME FOR MY OWN PROJECTS. Every single year. No one to answer to, no one telling me what to do. 100% my own time to read and think and write and make things. As I said in my "learning subjective" for #Rhizo15, my goal is to energize that whole process this summer in fabulous new ways. I'll freely admit that I am selfish and protective about that time, too. During the school year, I commit every working day to my job, and in the evenings and weekends, I'm mostly just recovering, ha ha, because I really do work hard. So, when summer comes, the difference is total: I still work hard, but it is on projects that I choose. Basically, during the school year I am all about trying to find ways to help my students as they work on what they choose... but summer is my choice! This summer I'll have some traveling to do (so far 2015 has been a pretty hard year for me, as my mother died, and so my dad is now on his own), and I'm also going to my first conference in years: DML in June! But aside from that, I'm going to be doing India-India-and-more-India this summer, retooling my Indian Epics class much like I did my Myth-Folklore class last summer. And for those who watched the Myth-Folklore Textbook happen last summer, this may be hard to believe but ... I am even more excited about this project! It's a harder project, which is part of why it is exciting, but it is also one that is really meaningful to me personally because I am going to learn SO MUCH. I discovered Indian storytelling and the Sanskrit language much too late in my life (see below), but now I can make up, at least in part, for the Indian education I never got to enjoy for myself. I want to know ALL the stories, and given the vastness that is Indian storytelling, such a project would take a lifetime. But three months sounds pretty good to me! Plus, I have the benefit of the tricks and strategies I learned from the massive project I did last summer. Overall: The goal is to move my class from using four paperback versions of the epics (Ramayana by Narayan and by Buck, Mahabharata by Narayan and by Buck) to an UnTextbook model where students can choose to read the printed books if they want, or they can choose to do all their readings online from public domain sources, along with a comic book option available on reserve in our beautiful Bizzell Library. So, to make that happen, there is a series of tasks I need to accomplish. These are more or less in order, although they are a kind of "rolling" agenda in the sense that I can start on the first few projects now and then add on the later projects as I complete the earlier ones. Luckily, most of these are open-ended in the sense that there is a bare minimum I have to get done for my course to go well in Fall, but above and beyond that bare minimum, I can really just go with the flow. Then, thanks to the wonder-working goddess of the OU Libraries, Stacy Zemke, the Library also purchased a set that will be on reserve for my students. So, I need to catalog the comic books and transcribe the little blurbs from ACK so that the comic books will be really searchable. The ACK website itself is pretty terrible and I have not yet found a good comprehensive text document anywhere online that lends itself to searching for specific comics. As a result, this catalog will be something useful for me, for my students, and I hope useful to the public at large! This will be happening at my Amar Chitra Katha blog. Bare minimum: Write up blurbs on the Myth, Folktales, and Classics comics; the Bravehearts and Visionaries can come later. 2. 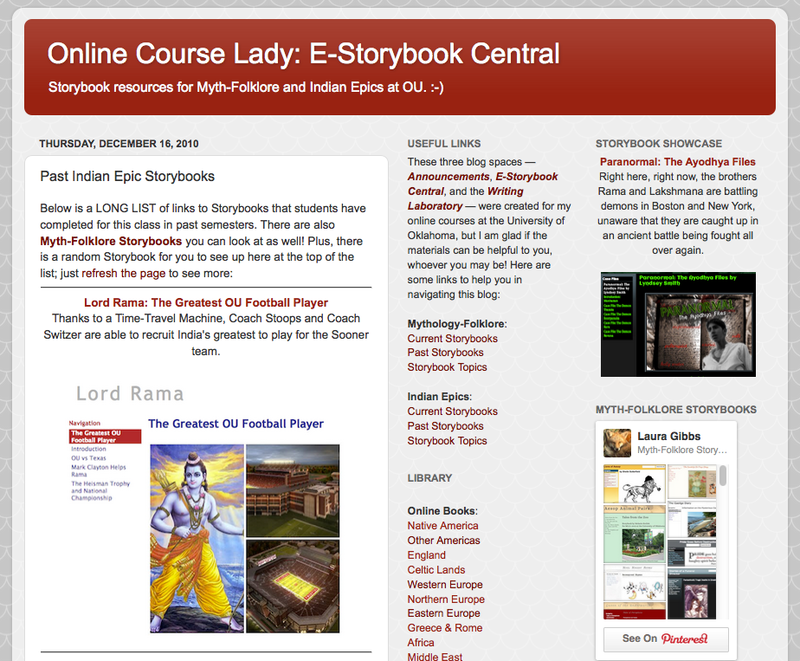 Create my own Ramayana and Mahabharata online anthologies. This is a huge challenge, and I need to start at the beginning of the summer so that I have lots of time to revise. Basically, I want to create for each epic an online anthology of readings drawn from different public domain sources that would be appx. 150-200 pages long if it were a printed book (but they will take the form of individual blog posts for linking, remixing, etc. and also for easily including images, embedded video/music, etc. ; Ramayana I am sure I can do in 150 pages, but Mahabharata will probably take 200). I'll have more to say about this in a separate post, but I see this as the biggest online writing challenge I have ever set for myself. I've been inventorying all the public domain sources I can draw on, ranging from literal English translations of the epics, to English verse translations, to prose retellings, along with audio resources at LibriVox. My goal is to make an online book that students can read over a two-week period which will give them an overall sense of the epic (comparable to what they now get in my classes by reading Narayan's condensed versions), and which will also give them a sense of which public domain books they might like to read for themselves later on in the course. Bare minimum: I'm aiming for 50-60 episodes as a core for each epic (each episode as 500-1000 words or so), knowing I can build on that later, swap episode content, etc. 3. Write up Reading Guides for the public domain books. This item goes hand-in-hand with the previous item. As I write up the Reading Guides for the public domain sources (here are the Reading Guides I've done for the four class books in the past), I'll also keep an eye out for episodes that are really well told so that I can transcribe those episodes (most of the sources I am using are just page-images, not fully digitized texts) and consider them for inclusion in my own Ramayana and Mahabharata anthologies as described above. I'll start with the books (only a few of them unfortunately) that are available at Sacred Texts and/or at Project Gutenberg (which has better proofreading than Sacred Texts) so that I can being by copying-and-pasting, only transcribing when I need to use texts from Hathi Trust, Internet Archive, or Google Books. 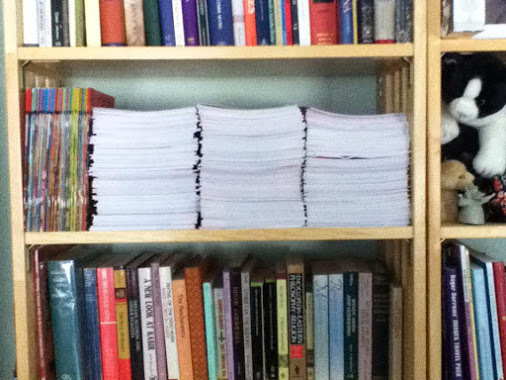 Bare minimum: I need enough reading guides for 16 weeks of free reading (i.e. 8 weeks with at least 2 choices each week), ideally 24 as the minimum. 4. Keep building my Indian images library. Right now this exists in a kind of higgledy-piggledy way across my Indian Epics Resources blog, my Pinterest Board, and my Diigo bookmarks, but I've already started normalizing that (making sure that I bookmark everything in Diigo in order to avoid duplicates), and I'm really excited about developing this more systematically. Being able to include images in the anthologies (see above) is essential; in some ways students prefer to read the paperback books, but the images are a powerful lure to get them to read online. For most of the students in the class, the world of the Indian Epics is completely new and foreign, and the gorgeous, thought-provoking images are the best method I have to provoke the students' curiosity. Also, just speaking for myself, I love working with images. This is going to be a really wonderful part of the summer! Bare minimum: What I have in my Library is actually enough, so this is truly an extra, but a fun extra. I'll probably set myself a goal of 5 new images per day, something like that. 5. Write up Reading Guides for the comic books. This is a project I can start as soon as I finish the cataloging of the comic books described above. My goal is to make sure that there are abundant comic book reading options for the second half of the semester which is all free reading (Weeks 9-14), but I also want to make sure to have some comic book materials available for the free reading in Week 4 (Ramayana-related) and in Week 7 (Mahabharata-related). My goal is to blend the comic book reading with other online sources, as you can see here in the Reading Guide I wrote up to go with one of the jataka comic books: Monkey Tales. I'll be able to use these for my Myth-Folklore class also, which is another big plus! Well, writing that out made it seem less intimidating! Of course, it's an infinitely large project because of all the materials available online and all the ways I can make those materials useful to my students, but what's great is that I can build the bare minimum (comic book catalog, the two anthologies, plus a core set of Reading Guides), and then just see how much more time I have. I cannot believe all the great things I am going to get to read this summer... especially the Mahabharata-related materials. 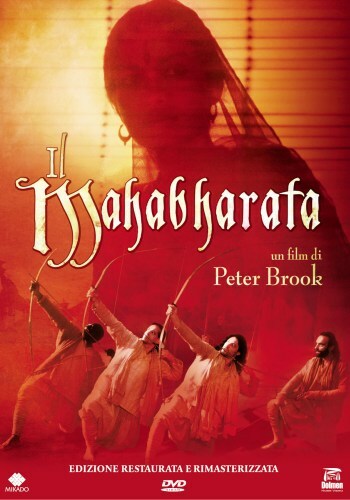 Discovering the Mahabharata in the form of Peter Brook's film shown on PBS back in 1990 changed my life forever, making me realize that my undergraduate education had been absurdly incomplete — the most absurd thing being that I had no idea whatsoever how incomplete it was. Being completely mesmerized by that film from the very first opening moments led me on the most extraordinary path for the next ten years. That path led me to graduate school, where I read and read and read (I was a reading machine for those six years at Berkeley), but since I finished graduate school in 1999, I have not had time like that to devote to my Indian education. Of course, I have been incredibly lucky to teach this Indian Epics class at OU because it means I have learned a lot and read a lot, in bits and pieces, over the past 15 years (and even during my brief stint in the Classics department at OU, I taught an Iliad-Mahabharata course). Now, at last, I get a chance to take a deep breath and plunge into three months of reading. I cannot imagine a better summer for a bookworm like myself............! And I hope everybody else is expecting a glorious summer as well! I have no idea what my students are going to learn in my classes. I hope they learn A LOT... but I know that they are all going to learn different things. It would be horrifying, in fact, if we were all learning the same thing. Choice. Cuique suum: to each their own. One of the best things I did in my Myth-Folklore class this year was to create something I call the UnTextbook, which is a giant collection of myth and folklore readings from around the world, and the students build their own textbook week by week with the choices they make. Students take notes on their favorite stories from what they read each week (they share those notes in their blogs), and then they retell one of the stories in their own way (and the stories go in their blogs too). So, one layer of personal choice and then another layer of personal choice... all those blogs, all those stories — and then at the end of the week, they visit each other's blogs and see what they can learn from each other. Different reading, different writing... nothing the same. The best antidote to boredom I can think of, as well as the best recipe for learning. 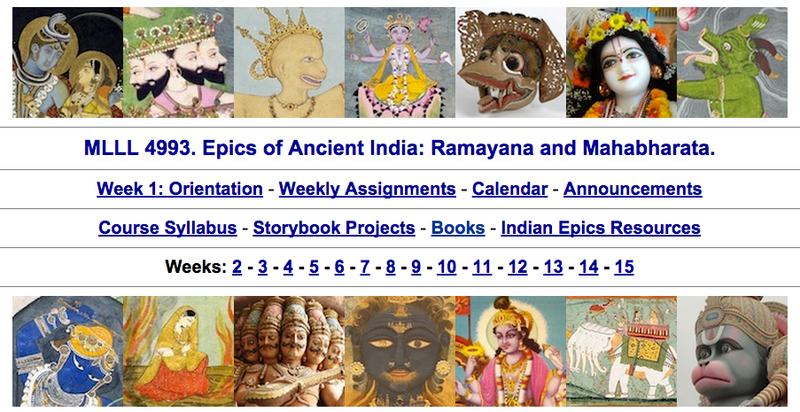 This summer, I am really excited about building an UnTextbook like this for my Indian Epics class. MY SUBJECTIVE: I'm hoping that #rhizo15 will give me all kinds of ideas to energize that process. Here's my contribution to Scott McLeod's great challenge: We have to stop pretending. Ask yourself: When it comes to education, what are 5 things that we have to stop pretending? Post on your blog, tag 5 others (I'll tag people at Google+), and share using the #makeschooldifferent hashtag. You can leave a link to your blog post at Scott's blog post. 1. That we can leave poverty out of the picture. 2. That standardized tests and grades measure learning. 3. That students can learn if they are bored. 4. That people who have never been teachers are "education experts." 5. That a traditional classroom is the best place for teaching and learning. Every time I read about D2L and Brightspace and their claims to be all about data, I have to ask: if they are really all about data, why can't I get the data I need out of the system and manage that data in the ways that are useful to me? Like, uh, in a spreadsheet...? I've ratcheted back my use of D2L to the barest minimum: I use the D2L Gradebook to record the students' progress on their semester-long projects while the students do "Declarations" (true-false quizzes) that record the points for all their other completed work (because, yes, grading is a FERPA/security thing). Unfortunately, while the Gradebook gives me the total points needed to calculate the grades (and I am glad the students can check their total points at any time), the Gradebook does not give me the data intelligence I need to keep track of student progress and to communicate with the students effectively about their progress. In this post, I'll explain how I try to "hack" the D2L Gradebook using a text field. This works pretty well for me, and it's taken me a few years to figure it out, step by step, so I'm sharing it here in the hopes that, mutatis mutandis, it might be useful to others who want to be proactive about their students' progress in a course. 1) The limited options for sorting and filtering are totally inadequate. This problem is COLOSSAL; all other problems pale in comparison. 2) You cannot adjust the display width of the columns. 4) You cannot easily create ad hoc columns for labeling and sorting. 5) Text-field columns have a very narrow length limit (I run up against that limit with my system below). 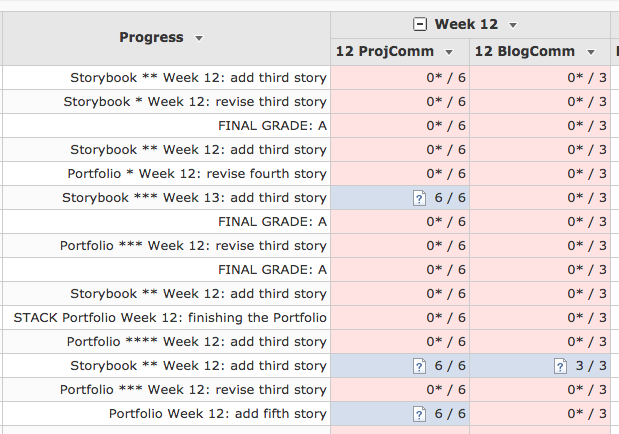 6) You cannot change the order in which the columns display without also changing them for the students. 7) Rules and formulas? Nope. 8) Filter views? Uh, no. 9) Freeze rows? Of course not. I'll stop there because if I let myself go into the double-digits, I'll be here all afternoon imagining the things I'd like to do with the D2L Gradebook but which I cannot do. Basically, think about everything you might want to do in a normal browser-based spreadsheet like, say, Google Spreadsheets. Safe bet: you cannot do ANY of those things in the D2L Gradebook. 1) If multiple assignments are due on a particular day (there are often two items due), I need to send emails to students who have not done BOTH assignments. 2) If there is a choice of assignments on a given day (often there is a choice of two mutually exclusive assignments), I need to send emails to students who have not done one OR the other. 3) Students who are outliers (either way ahead or way behind) need to be filtered out of automatic email reminders: students who are ahead don't need reminders or encouragement emails (they are simply choosing not to do assignments, which is fine), and students who are far behind need more personalized email, not a form email generated by an algorithm. 4) Based on their own personal progress through the semester Project, students get a variety of different email reminders: depending on whether they are doing a Storybook or a Portfolio, whether or not they have free pass(es) remaining (for a Storybook project), whether or not they are doing a revision or a new story, etc. By using the flag (yep, one flag only) and sorting on a single field, I can then eyeball the other column(s) I need to inspect manually, I can take care of situations 1 and 2 and 3 above. That is really frustrating though; I sometimes make mistakes (because I have to eyeball up to four columns to determine who gets an email on a given day), and it is ridiculous for me to PRETEND to be a computer, applying an automatic algorithm manually, when any self-respecting spreadsheet would make that completely easy to do with filters, sorting, etc. I do not have a way to keep track of Storybook free passes in this field because that is an actual numeric field that goes into their total points, but the free passes are indirectly reflected in the asterisks above (for students doing Storybooks, up to two asterisks get recorded as free pass points). There is other information I would enter in the text field (a one- or two-word story title as a reminder), but the text field length limits won't allow it. Sort: I can sort the field in order to see what assignments I have in the stack to grade (it's a good way to double-check to make sure I don't lose any, and it also assures the student I have their assignment), and I can also quickly sort the Storybooks from the Projects (they are two different types of semester-long projects, based on each student's choice, and require different kinds of assignments, emails from me, etc.). The alphabetical sort works because there are only four strings that can start the field (Storybook, STACK Storybook, Portfolio, STACK Portfolio). Search on Week/Type: The way Chrome is set up, Control-F search provides great highlighting on the screen AND a count. So, I can check to see who needs to turn in a revision assignment for Week 12 by searching on "Week 12: rev" and send an email accordingly. So too for the different email I sent to people who are supposed to add a new story: "Week 12: add" does the trick. Because I am searching on the week number and type of assignment due, I don't accidentally send emails to the people who are working ahead. I have to be careful to eyeball who is in the stack or not, so after I do the search and select the people who need emails, I then search again (the browser search doesn't clear the checkbox selections thank goodness), highlight STACK to make sure I don't accidentally send to people who have already turned their assignment in. Search on STACK: I can also search on STACK to get a quick count of number of assignments in the stack for me to grade. Search on Asterisks: Anyone with three or more asterisks (either project) is potentially in trouble, so I can search on them periodically and send them an encouraging email of some kind. My goal is to make sure that students focus on what they CAN do now to make progress, not fretting about the weeks of work they might have missed. It's always possible to pick up and just keep going with these projects; they are super-flexible that way, but some students get into a kind of self-punishing mode if they are behind, so I need to make sure they know what to do to pick back up and keep going. Now, it is totally dopey that I am using browser search highlights to do the work for me that the spreadsheet SHOULD be able to do. But at least it works! Communicating with students in a timely and accurate way about all their work in the class, especially their semester-long projects, is incredibly important to me. What a shame that D2L does almost nothing to help me do that. Every time I use a Google Spreadsheet, I think about what how nice it would be IF the D2L Gradebook were a real spreadsheet. But it's not. And one of the reasons I use Google Spreadsheets every day is that there are lots of other data items I track re: my students and their projects which I don't even try to do in the Gradebook... so I do that in a totally separate Google Spreadsheet which I maintain manually. 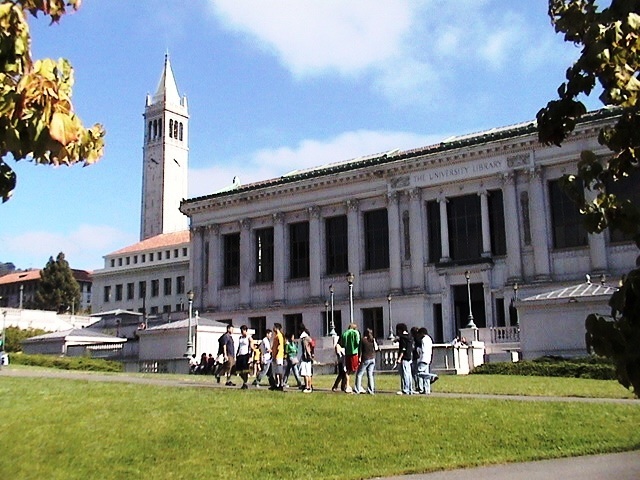 I finished a Ph.D. in Comparative Literature at UC Berkeley in 1999; my main area of interest was Aesop's fables and I basically lived in Doe Library. I am very lucky that in the years since I left Berkeley and my beloved library behind, most of the books I consulted there are online: old books! 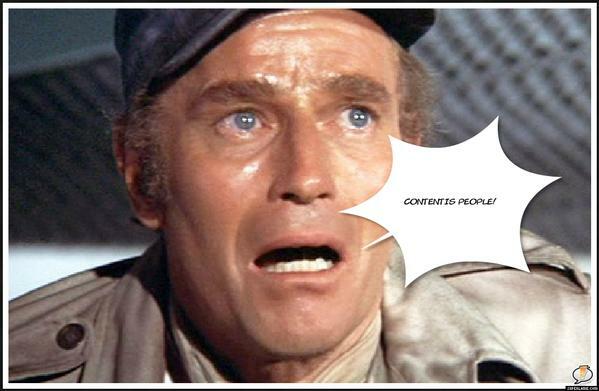 public domain! digital bliss! 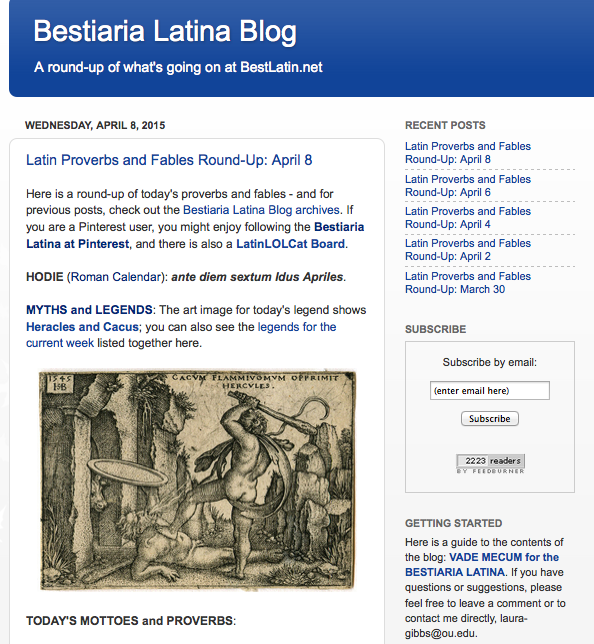 As a graduate student, I taught Latin, and although I no longer teach Latin (alas...), I have a long-running Latin blog, the Bestiaria Latina, at BestLatin.net. 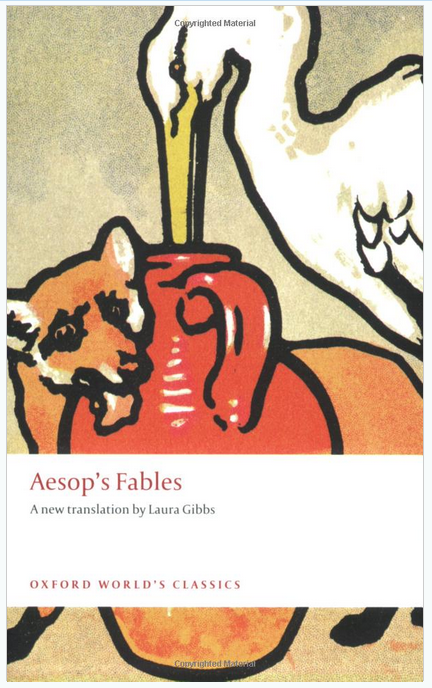 Aesop continues to be an obsession of mine, and I've published an English translation of Aesop's fables for the World's Classics series by Oxford University Press. The book of which I am most proud, though, is a huge collection of Aesop's fables in Latin: Mille Fabulae et Una: 1001 Aesop's Fables in Latin. That book, along with the other books I have written for Latin students and teachers, can be downloaded as free PDFs here: PDF.BestLatin.net. 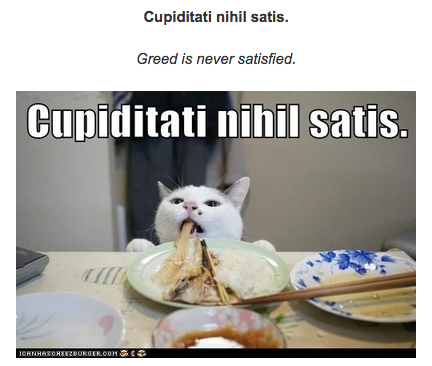 And, yes, my LatinLOLCats are probably my biggest Internet claim to fame: LOL.BestLatin.net. 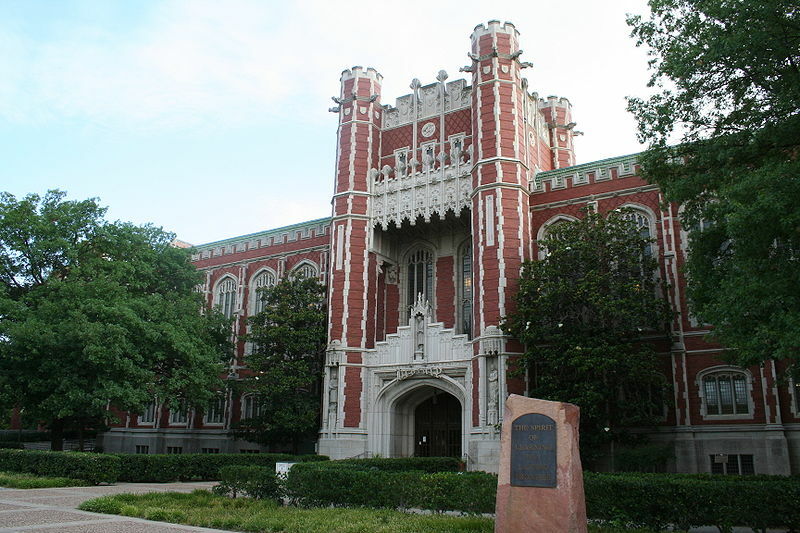 After finishing at Berkeley, I joined the faculty at the University of Oklahoma in 1999. Since 2002, I've been teaching fully online: one course I teach is Mythology and Folklore, and the other is Epics of Ancient India. You can find out all about the courses and my other projects at MythFolklore.net. I've been teaching the same courses every semester, but no two semesters are ever alike because student creativity drives the courses. It's such a great adventure every time! In both of these classes, the students publish "Storybook" websites in which they retell traditional stories in fantastic new ways; you can see their projects at Storybooks.MythFolklore.net. To take advantage of the wonderful public domain books available online for mythology and folklore, I recently (summer 2014) created an "UnTextbook" of folktales and myths for the Myth-Folklore class; you can see that here: UnTextbook.MythFolklore.net. The students have 100 reading units to choose from, with trillions of possible combinations: each student basically makes their own textbook. My goal for the summer of 2015 is to create a similar UnTextbook for the Indian Epics class. 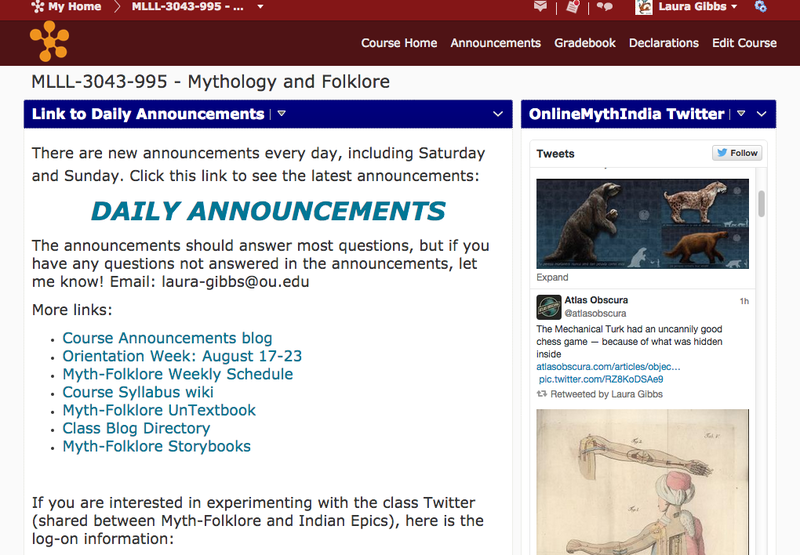 Thanks to an inquiry from Tassie Hirschfeld (OU Anthropology), I wanted to explain the way I use Twitter to share announcements and fun/useful stuff with my classes via a Twitter widget in my D2L homepage. So, first things first: my Twitter handle is @OnlineCrsLady and my class Twitter is @OnlineMythIndia. To get a sense of the kinds of content I share with my students, take a look through the class stream. Some days I share more than other days, but I usually have good stuff to share every day, and it takes only a few minutes. It's all about retweeting: I'm just sharing other people's Twitter content! I share lots of items related to the University of Oklahoma, and I also share artwork, music, and books from the Twitter feeds I follow with my class account. So, how do students see the stream? A few of them follow the class stream at Twitter, but most of my students are not Twitter users (alas! I wish they were; we could have even more fun that way). Yet even though my students are not Twitter users, the students still see the Twitter class stream ... thanks to the power of Twitter widget. Twitter widgets allow you to share Twitter content (a stream, a hashtag, etc.) by displaying the Twitter content inside other websites. 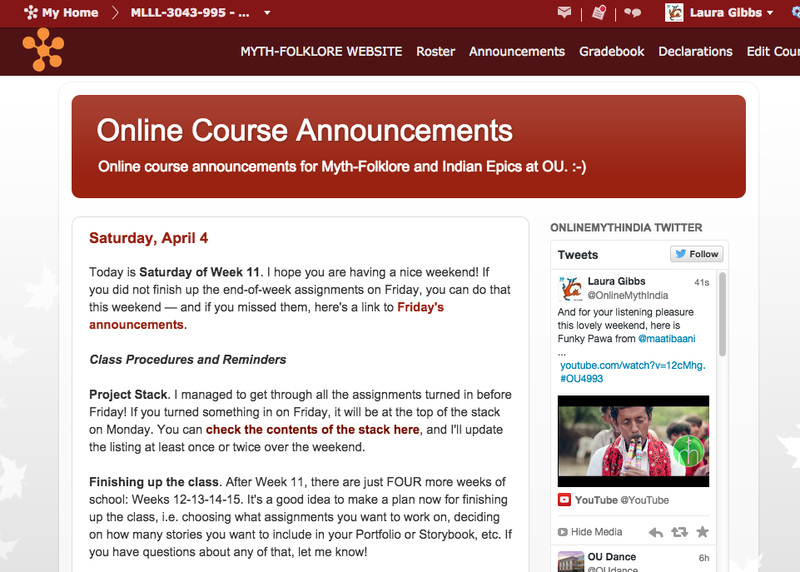 For example, you can see the Twitter widget for OnlineMythIndia in the sidebar here: Class Announcements blog. Step Two. Create a D2L Twitter Widget. To create a new D2L widget, click on Edit Course, and then choose Widgets. Click Create Widget and give your widget a name. Click on the Content tab to add the Twitter widget code you copied from the Twitter widget page. You need to switch to HTML mode by clicking on the <> icon in the lower right-hand corner, paste the Twitter widget code into the popup box, then save, and then save the widget. You can preview the widget to make sure it is working. Update: For detailed instructions with lots of screenshots, see: D2L - Add A Twitter Feed. Step Three. Add Twitter Widget to D2L Homepage. To add your widget to your D2L homepage, go to Edit Course, and then click Homepages. Next, click on your homepage to edit it, click Add Widgets, and then add the widget you created. Save your homepage, and your homepage is now alive with Twitter! For the rest of this post, I'll share some of the reasons why I love using Twitter for class announcements, along with some tips and strategies. My approach is admittedly idiosyncratic, having to do with the classes I teach and the kinds of online content that I enjoy... but, mutatis mutandis, some of the things that work for me would probably work for others too! 1. Fresh content. I can always find fresh new content all day, every day. I follow OU faculty and OU programs already (it's the main way I keep up with news at my school), and I find lots of tweets to share that way. It's also fun to keep an eye on the museums and other streams I follow with the class account; there's always something new worth sharing whenever I look. I am especially lucky because the courses I teach have a lot of overlap (Indian Epics can be considered a subset of Myth-Folklore), so that means I can use the same stream for both classes. Hence the name of the stream: OnlineMythIndia. 2. Lots of images. Images are good for the brain! My favorite Twitter content to share consists of images: paintings, posters, cartoons, etc. I ask my students to read and write a lot, but I also want them to see and enjoy all kinds of images. I especially like the clear, intriguing way that the image thumbnails are displayed in the Twitter widget; to me, the thumbnails are very attention-getting, and I hope they can be attention-getting for my students to. 3. Videos too! Twitter is very video-friendly! For example, when you include a YouTube video link in a tweet, there is an embedded player so that the video will play right there in the tweet. The video will even play right there inside D2L inside the embedded widget: no kidding! Here's a screenshot of Maati Baani's Funky Pawa... and you can listen for yourselves here at the tweet. It's hard to see in the screenshot but the video is playing: instant music! 4. Easy to manage. Two accounts are easy to manage with two browsers. There are lots of tools out there for managing multiple Twitter accounts, but the trick that works best for me is to be logged in to my own Twitter account in Chrome, the browser I use almost all the time. Meanwhile, I am logged in to my class account with Firefox. To share a tweet I see in Chrome over in Firefox, I just copy-and-paste the URL of the tweet (click on the time-date stamp of the tweet to get the URL) into the Firefox browser bar, and then I can reshare the tweet. 5. Hashtags. I love hashtags! Searching by hashtags is a great way to find additional content, and it's also very useful to add hashtags to your own retweets. To do that, you need the Classic Retweet Extension (available for both Chrome and Firefox). It's called Classic Retweet because Twitter used to allow editing of retweets; it's kind of maddening that they took that great feature away, but Classic Retweet solves that problem! 6. Lists. Twitter lists are a great way to follow specific types of content. For example, as I mentioned above, I use lists to keep up with hundreds of OU faculty and programs. You can see the tips I give my students about Twitter lists here: Twitter lists. 7. Modeling digital literacy. I want to model digital literacy for students. Even though most of my students do not use Twitter, I am glad that they have seen someone using Twitter in a fun and effective way for professional and educational purposes. As a result, they know that it is possible to use Twitter this way! 8. Building online presence. Twitter is an important part of how I build my online presence. As someone who teaches fully online courses, I need an online presence that "shows" students who I am. The Twitter stream helps the students get to know me as they see the kinds of things I like and share. 9. Harvesting and archiving. Most Twitter content is ephemeral, but when I see Twitter content that I want to save for repeated use in the future, I save the tweet in the Pinterest Portfolio Board that I keep for each of my classes. To do that, I just open the tweet in its own window (right-mouse click on the time-date stamp to get the specific tweet as a URL), and then I pin the tweet. Here are my class Boards: Myth-Folklore and Indian Epics. I like the way that the Pinterest Boards are accessible to my students too. Not all my students use Pinterest, but far more of them use Pinterest than use Twitter! 10. Twitter is ... fun!!!!! Having fun is one of my main goals for teaching and learning online, and I think Twitter is so much fun! When I need to take just a quick break from work, Twitter is the perfect option. My main hangout online is Google+, but I can get seriously lost in there, writing long posts, getting involved in long discussions. The way I use Twitter is very different: ephemeral, fun, fast. It never takes up much of my time, but it manages to pack a lot of pleasure into that small amount of time!